I won’t retell the history of the coaster, but it’s a complex New Year’s Resolution tradition that I’ve carried with me to Australia. How did BJR do on last year’s Coaster? Writing Mum a handwritten card once/month. Delivered! When I visited Mom, she had several cards displayed. In the world of email, a handwritten note can have more meaning than it used to. Microadventure with my pal Tash once a quarter – 0/4. Didn’t even do one. Huge fail. Meditation – this went away after one month. Unfocused. Sub 11 hour Ironman at Cairns – this one disappeared quickly. Without question the least training I’ve done for any half or full. Led to “retirement” from triathlon. Slow. Swim 250K in the last six months of the year. Maybe I did 10K total in those six months. Drowned. Raise $100K for Room to Read. Proud. My friends are crazy generous. So, 3/9 is a pretty poor year. That’s an F- for those of you scoring at home (insert your favorite scoring at home joke here – actually insert mine, mine is funnier). How does BJR feel about 2016 in general? Stop anthropomorphizing an arbitrary revolution of the earth around the sun. It bears you no ill will. I am proud of the people I work with, and amazed by them every day. My inability to understand my own limits not only caused myself, but others, a great deal of pain. I need to spend more time serving others and less time on a laptop, iPad, or phone. Best Night’s Sleep: first night in Poland in late November. The World Transplant Games record for the 200m Individual Medley for age group 40-49 is 03.01.99. Mr T. O’Hagan of the United Kingdom, I think I can get within 30 seconds of that. We’ll see. Right now, I can only do about 15m of Butterfly, and I’ll need to get to 50m. 2. Mum, it’s me. Your son. Your son Bryan. The one in Australia. I didn’t talk to Mum nearly enough this year. I will call Mum every three weeks. Minimum talk time: 30 minutes. My friends put this one on my Coaster. I’m an open book. Perhaps too open. Regardless, I now must go on three dates with the same person, and not tell a single other soul (other than the person I’m on the date with). I’m still not sure if my friends think it’s not healthy for me to talk about all the details of my life, or whether they are just sick of hearing me talk and will find any reason to shut me up. 4. Me llamo Bryan. ¿Donde están sus pantalones? I will visit Spain twice this year, first for our European customer conference in Barcelona, and then again for the World Transplant Games in Málaga. I studied Spanish in high school, but it’s stale and at best ‘survival Spanish’ and I’d love to rekindle my meager conversational skills. I’ll spend two hours each month from January through June speaking Spanish with a fluent speaker, and dealing with them laughing at my horrible verb conjugation. Voy a la playa con su hermana. No, no – Fuí a la playa con su madre. A few good friends are Buddhists, and my travels in Cambodia have made me want to understand it more. I’ll spend 15 hours studying Buddhism this year to understand the history, the philosophy, and the practice. I hear reincarnation is making a comeback (not a BJR original, 100% plagiarism). At some point in my life, I will flee the city of Sydney and head to a smaller town. Ideally, I’d live on the beach somewhere between Forster and Noosa. But, I actually know next to nothing about most of the towns along that coastal stretch. So, I’ll take at least a week long trip North of Sydney to figure out if that’s really the someday-future home of BJR. I will have 2 servings or less of red meat in the entire year of 2017. I don’t each much red meat – even after discovering that lamb is red meat (they are white on the outside, so I just assumed). I’m going to cut it out entirely this year, largely for ecological reasons. It’s a small measure, but every year I try and reduce my footprint a little bit more, while still keeping my feet the same size. My friends suggested I allow myself 2 servings in case of emergency, like if I’m trapped in an elevator with a cow and a BBQ for 24 hours. Note that would still count in my book as 1 serving. I can’t provide the details on this one. It’s private, because it impacts other people, and I want them to be surprised when I build my army of sociopathic robots. I, for one, welcome our new artificially intelligent overlords. Before the end of the year, I will return to Cambodia. Just thinking about this makes me smile. In late November and early December, I did my first around-the-world trip, Australia-Poland-US-Australia. Two weeks, 7 flights, 60 hours of travel time. Simple outcome: I learned a decent amount about others and myself. Snow! Made the whole trip worthwhile. Walking on the frozen ground to work in the morning, even the graffiti seemed to fit into the snowscape. I’ve been to Gdansk, Poland four times now. Three flights to get there, about 34.5 hours from leaving Manly Beach to arriving at the corporate apartment. This was by far the best trip, although I didn’t see Malbork Castle, or even visit Old Town once. I simply focused on the purpose of my trip. I knew the grocery store well enough to buy the right foods, and every morning, a prison-cell workout (confined space), two breakfasts, and I was ready to start the day. As long as I wasn’t at work, if my body said “I want to sleep,” I slept. No attempt to adjust to time zone, just let it happen. I constantly fill my time with too much. On this visit, I said “No” more than “Yes”, and ended up healthier and happier. Go figure. I really love my family. Seriously – ignore the facial expression. And Mom was actually awake at dinner. Promise. Thanks to the Lufthansa strike, there was a small ripple of early morning chaos, but the airlines and one of my co-workers had smoothed everything out. I visited Copenhagen for the first time, but only to go from one gate to another in the airport. Landing in DC, I spent the weekend in Stafford, Virginia, with the largest collection of my immediate family. My sister’s family and my mom both live there, and two of my nephews returned for the weekend. Every single minute there is great: helping Mom grocery shop, walk in a nearby park with my sister, a dinner out. While home is Australia, where my sister lives will always be a place that’s special to me. I’ve always worried that in a different time, I would have let tyranny happen, or even worse. I’ve never been drawn to protest or to activism. What would it take to get me out of work, off the bike, out of the pool, and into the streets. Well, it turns out, Trump. There had been protests in SF, and I was hoping I could join in while I was in SF. Honestly, I am probably not politically aligned with most of the folks who would be in an SF protest, but part of what I wanted to do was expose myself (ahem) to people with different thoughts, different opinions, and actually listen. I’ve been barking for years about how neither side of the fence actively listens to the other (I know from experience, having been someone for years who could only absorb arguments that agreed with me). Selection bias is alive and possibly more powerful than ever. Alas, no protests were scheduled (turns out there is an online schedule for political activism!) But there was a meeting of the Progressive Democrats of America on “the TPP (Trans Pacific Partnership) in a post-Trump era.” The TPP is a big deal to Australia, so I thought I could get educated and listen to people who I would never encounter on a daily basis. After dinner, I slipped a gray wool jumper over my “I voted for Gary Johnson” t-shirt, and entered the Fireside Room at the Unitarian Church. My first thought was that I had stepped into a cabin in North Dakota. About 30 people in total, and I was the second youngest person in the room. Equally balanced between men and women, the audience was mostly white. Not a single button down shirt in view. Doing the math, I realized most of this group were teenagers in the 70s, so they were not the 60s hippies but certainly had a memory of the Vietnam War that I do not. A few items of business passed slowly: Bernie’s influence and getting pervasive agenda items in the national forum, the 60th anniversary of the human rights declaration in 1948, passing around some stickers, and collecting about 10 signatures for a letter to Pelosi. I wondered what the punishment was if they found out a libertarian was in their midst? Stoning? Tattooing? Forcing him to surrender his property to the state? Mind, open back up. My first spark of interest came around a mention of driving corporate money out of elections (a big hot button for me – New Zealand’s limits on campaign contributions are much more sensical). I shared the same passion with everyone in the room for reducing corporate influence on elections. My favorite aside of the three talks, was when one speaker described the coming Trump Administration as “The most corrupt oligarchical administration in history. A cabinet of billionaires. Prepare for the selling off of our country to the highest bidder.” I’d have to agree with what I’ve seen so far. “Don’t use Google” (because of their support of the mainstream Democratic party, I think). Sorry, still going to Google stuff. “Trumps victory was a movement victory, not a campaign victory.” Groups of people do take independent action, that campaigns cannot withstand. “Boycott Wells Fargo” – as it’s backing the Dakota pipeline project. I don’t know if I’ll cancel my account today, but I will register my opinion with my bank and make sure they understand it makes them a less desirable option. The Digital millennium copyright act failed in Congress, but similar agreements were then snuck into trade agreements, meaning our democratic process is being circumvented. My favorite speaker was Ernesto Balcon, a member of the EFF. Since Mitch Kapor was the chairman of the company I started, and John Perry Barlow spoke at one of my Stanford classes, I knew a bit about the EFF, and have always held it in the highest regard. Ernesto only reinforced my opinion of the EFF. The best part about this group was that while their focus was politics, they were not political.”This is about the issues, not about what party you belong to.” That while they identified as a group with a specific set of beliefs, that they were open to others and wanted them to join their causes, not necessarily their party. “We share a lot of ideology with Libertarians.” I wanted to rip off my jumper and out myself right there, but I held back. It could be a trap. All in all, the PDA session (ahem) delivered – I heard new thoughts, I heard opinions I disagreed with but I listened and understood why we differed. Many times we wanted the same thing, but believed in a different way to get there. I need to find other outlets to make sure I keep hearing opinions that are different from my own, and even from the mainstream lines we get fed from conservative and liberal news media alike. I arrived home better than I left – an unusual event, and even more surprising given that I didn’t stay in a single time zone longer than six full days, and that I had circumnavigated the earth. Looking back on the trip – there’s a lot of goodness. I accepted my own limits. I listened to others to try to expand my world view. I focused on my responsibilities. I ate a lot of greek yogurt. In August of 1997, I was done working for a morally bankrupt company (Trilogy) and planned to start Reactivity with John and Brian in January of the next year. So I took two months off, and with my girlfriend at the time (who later graduated to ex-wife), we cycled for two months around New Zealand. Wow, this is a really positive sounding start to a blog. On October 28th, 2016, I returned to New Zealand for the first time – and had to relearn its magic all over again. 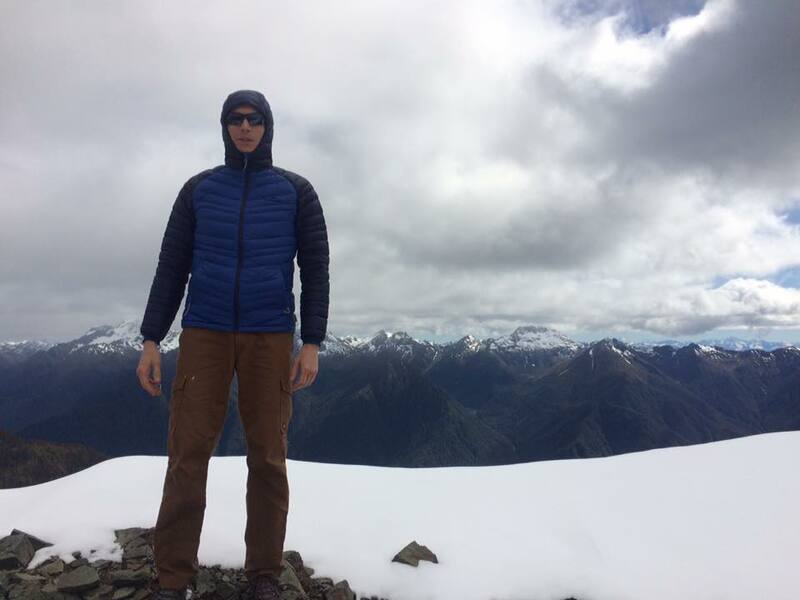 With a great friend in tow (Nick, hereon referred to as NVB), the South Island of New Zealand once again submerged me in a dream I didn’t want to leave. I often have major packing failures. As the plane descended, the JetStar (can’t believe I agreed to fly JetStar) pilot announced that it was 7 degrees C outside. At this point, I’m wearing a t-shirt, and realizing the one thing I did not pack was a jacket (this after reminding NVB that “it’s going to be cold, Singapore boy. Dress appropriately.”) Dropping $$$ at Kathmandu with 5 minutes left to spare before the store closed changed that (and helped me realize that Kathmandu has an h – who knew?) and I was outfitted for the trek. I’ve packed Patrick White’s Tree of Man for this trip. It’s a beast to carry, and the first few pages are dense. This book might be more painful than the hike. I haven’t hitchhiked since I was in my 20s, and I haven’t picked up a hitchhiker in a long, LONG time (maybe also in my 20s). As Nick and I left Queenstown, we passed a hitchhiker, and I mentioned that if there’s a place to pick one up, between Q-town and Te Anau is probably the safest place on earth. Around the next corner, we picked up a 20-something French girl with a Russian name who managed to talk almost non-stop for the next 3 hours, which helped the drive go faster. I am always a bit mystified by people who just travel – she had been on the road for a couple of years, stopping, working, traveling, stopping, working, traveling. I think I need to at least pretend there’s a higher purpose in life, or be very explicit that I have no illusions and I’ve just given up. The highlight of the conversation was NVB asking her to tell us which nationalities were the best and which were the worst. Apparently Turkish people are stellar! Day 1 – Ascent into Luxmore! We hit the trail after Noon, expecting it would be a late arriving into the Luxmore hut. Each day was about a 15-16k hike, with a little more than half of this day being ascending into the mountains. It has been a while since I carried a pack, but my legs felt great, and I like to move at a quick pace, the cool air helping keep the pace high. We made it into camp earlier than I expected. The huts of NZ tracks are seriously posh – mattresses! And gas stoves! And running water you can drink! While you are staying inside a bunk room with up to 20 other people, the huts make it a lot easier than tent camping. The views from the hut are breathtaking – partially because the air was cold, but mostly because you don’t have to see another human being for ever looking 360 degrees from the hut. Just mountains, lakes, green. My mind wanders forward to a time when I can travel for months, to not see another human for days, or maybe even weeks. Peter the Ranger gave us a safety talk with a few hijinks like pulling a dead stoat out of his pocket and pretending it bit him. Peter’s humor delivery doesn’t change tone for punch lines, and his white out-of-control beard masks any facial expressions. NVB did incredibly well today, and he’s possibly the best travel companion I’ve ever had. Talkative, quiet at the right times, easy-going, and clear about what he wants. This trip was a good choice. The first half of this day was the best section of the entire trip. The second half was the worst. We left Luxmore hut to check out the limestone caves just a few minutes from the hut. Inside the cave, my headlamp wasn’t helping at all. Too dark, too slippery, too dangerous. Then I realized we were still wearing sunglasses. Taking those off helped. The path climbed further, close to the peak of Mt. Luxmore, where we dropped packs and scrambled up to the summit. I decided to run to the top, which was a bad idea. I’d need that energy for later. At our lunch stop we met a Dutch chick who was crushing a couple of Canucks – she was hardly breathing while they struggled to get up the last few feet to the “lunch table” outside an emergency shelter. The PB&honey sandwiches were golden. We walked along ridges that dropped off sharply on either side, feeling like we were skirting the spine of the world. I couldn’t imagine a better day. And then the trail began to descend. Within two hours, we had run out of food and water. NVB had broken his right kneecap, and I was losing a lot of blood. I fought off the dizziness and the desire to just lie down and sleep. We could hear the stoats around us, smelling death. Our compass and the terrain contradicted the map at every step, and we knew we were lost. We had no shelter, and the rain was turning into sleet. We were frozen one moment, and burning the next. The trail was jagged, and another misstep could end us. I knew everything depended on the next 15 minutes, and I didn’t think both of us could make it. It was then that I knew, I would have to kill NVB and eat him to survive. I’d start with the shoulder. No, no, no. It wasn’t that bad. But the trail dropped sharply, and descending has always hurt me – the impact of the pack proved I haven’t kept in the shape I need to be, and my feet and ITBs were taking a beating. It went on forever, and I could tell NVB was hurting. The next three hours seemed like six. By the time we reached the Iris Burn hut, NVB was near delirious, and was sick with a virus. That night the Ranger (Robbie) explained to the hut that we could either pack our trash our or he could kill us in our sleep. Or maybe not come pack to the park, I forget which. But this Ranger should be made Warden, it’s more fitting. Rose, the other ranger smiled mutely. I’m betting she’s the one that will choke us out if Robbie says the word. That night, the kiwi birds mating calls echoed on the lake. Get a room. We started the day with a walk to a nearby waterfall – a spectacular waterfall in every other country in the world, but simply par for the course for the South Island. Amazing. Most people headed all the way out on day 3 – covering over 30K. I know in my heart I could have done it, but it would have been brutal (and we would have had to start a lot earlier). So our pace was fine with me. The train followed a beautiful forecast rolling path along river, crossing wooden and metal bridges. A couple hundred Stoat and rat traps flourish through the entire route, though all are empty. I knocked on each one to see if anyone was home. Since the traps have not been as effective as hoped , a “1080 campaign” (dropping poison pellets from the sky) to rid the wilderness of non-native predators brought over by the POMs – species which have extinguished 50+ species of flightless birds and are threatening more. Along the path, NVB and told stories of relationships, of hitting bottom, in redemption. NVB’s cold worsened. At this point I didn’t realize how bad it is. NVB is a tough SOB. He kept moving, step after step, without complaint. Near the end, a derelict boat along the shore of Lake Manupouri welcomed us in advance of the hut. I jumped in the lake for a swim to clean up, and made it five strokes before I realized the water was so cold I could barely inhale. Our final day had minimal rolling and was mostly flat. My ITB was bad from the start, but it was only one day left! NVB and I were wondering if the US Presidential election was today (it was a week later). Seems like we should have known that. “First Tuesday” sounds right, but we’re not sure. World Series? (Nick is a big fan of The Tribe). The path was beautiful – and as a bonus, there were 2 rats in traps!! Hours later, I’d had enough walking. And we were done. On the drive up to Milford from Te Anau, I started to feel a scratch in my throat. I thought positive thoughts, hoping I wouldn’t get ill.
On the drive up to Milford, I passed the bus shelter where we had stored our bikes. It looked exactly as I remembered and pictured it. in 1998, we had to hide our bikes behind the shelter since it was snowing and our hands couldn’t hold on to the brakes anymore. Memories keep coming back. I got rid of all the photos from my 1998 New Zealand trip long ago – in fact probably burned some at some point in a misguided attempt at catharsis. But despite two-decade-old memories that foretold betrayal and loss, New Zealand is a special place that can’t be tarnished. New Zealand, I will be back! Last week was my third time competing in the Aussie transplant games. And I made the same mistake the third year in a row. The first year I really didn’t know much about it. I took a train to Newcastle, and just ran the 5K as a part of the opening ceremonies, and then took a train home. Just meeting a few people there, I realized I should have come for the whole week. Two years ago, in Melbourne, I spent most of the week there, but only participated in about three days of events, and worked the other half of the time. This year, I participated in four of the 9 days of events – and again, left knowing I should have done more. Yes, work, deadlines, a big event coming up. But this week is a chapter in the most important story of my life – the fact that I got a second chance. The first question most people ask me is “How did you do? Did you win any medals?” It misses the whole point of the games. It’s a miracle any of us are even suiting up for the games, much less being competitive. Every minute is humbling. You met another athlete whose story you can’t believe. Meet Adam, who is under 20 but has had a transplanted liver for something like 17 years now, and smiles bigger that the length of the pool. Meet Kate, the first woman with a heart + double lung transplant to complete a half-Ironman. Meet Andy, who ran the 5k with me who has a double lung transplant. But his training has been rough lately – because he’s currently undergoing chemo for liver cancer. Meet Rodney, who swam (incredibly well) who had a double lung transplant 18 months ago. When he got a silver medal, his eyes welled up with tears. I reconnected with people I met two years ago. After spending so much time around triathletes, all too obsessed with podiums and winning their age group, this group is a special one. Now, they still are putting everything out there, pushing themselves to the limit, and they are competitive. But the times and the medals take a back stage to the reason we’re there. Lining up for the race is the biggest accomplishment for us, and that the success of any of us in the games starts with the gift from our donors, contains an incredible amount of luck, and then we add in our own dash of effort. I watched a man over 60 years of age complete the 30k cycling road race – who didn’t even know how to change gears on a bike. He was pushing the bike up hills because he hadn’t figured out how to shift down. But his smile was the biggest of any of us . I still have a community allergy – I have a hard time being part of a group, even an amazing one like this one. I found myself often looking for a place to be alone and just take in what was around me. It’s a little overwhelming at times. So, answer the damn question. How did you do? My worst performance was certainly the cycling 5k time trial – I didn’t warm up, and my lungs just felt terrible the whole time (which is no time at all in cycling). It feels pretty lame when you complain about your lungs and the person next to you doesn’t have their original ones. The first ever triathlon at the transplant games was punctuated for me by two punctured tubes, so I had no way to complete the final 10k. I DNF’d but still ran the run course. Normally something like that would bother me for days. But the spirit of the games is too positive, too wonderful to let something like that bother me. The Sunday 5k run is the best time I’ve posted (just around 20 minutes flat) though I think the course was 200m short. Still, the wheels haven’t fallen off (yet), and I was the fourth person across the line, and the second transplant recipient. In the 30k road race, I managed to fight and hang on until it was down to the final five of us, until the last 400m, when I was subsequently out-sprinted by almost 100m. I felt great about all of my swims, though as the day went on, I definitely had less energy and began to drag in the 400m. I was certainly slower than 2 years ago. I did backstroke in one relay, which makes me want to train for the 200 IM for two years from now. Si, con mucho gusto. The World Transplant Games are in Spain in July. Why not?